[Feb. 06, 2018] The Program book v 3.2 is updated. [Feb. 06, 2018] All author notifications are sent for the accepted papers. If you do not receive any notification mail, please let us know ( witc2017.conf@gmail.com ). [Feb. 05, 2018] The Program book is updated. [Jan. 11, 2018] Round 2 Submission deadline has been postponed, and this is the final extension. Camera ready due date is tentative one. [Jan. 11, 2018] We sent an early registration information email to each corresponding author of paper ID 1-32. MUST check that E-mail. [Dec. 29, 2017] Round2 papers will be recruited from Jan. 1, 2018. The 2018 World Congress on Information Technology Applications and Services (World IT Congress 2018 Jeju) will be held in Jeju, Korea, February 20-22, 2018. 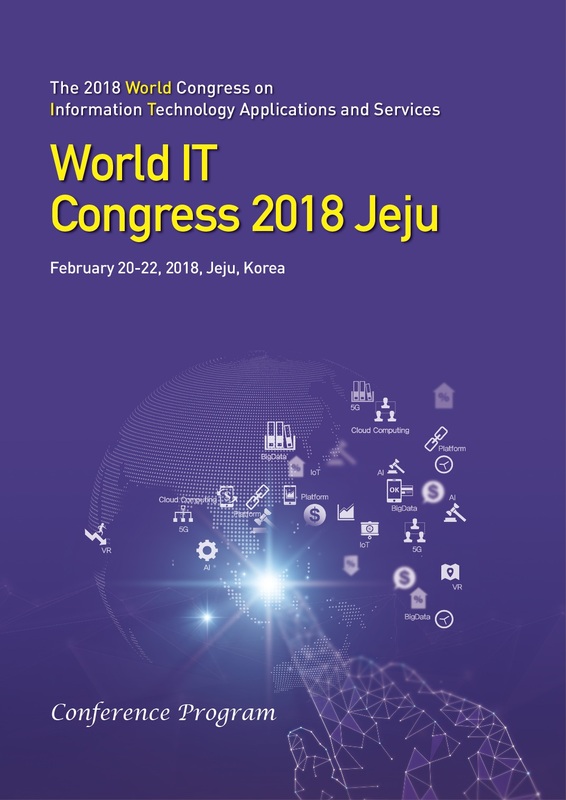 The World IT Congress 2018 Jeju is aimed at address key themes on "Advanced Mobile, Communications, Security, Multimedia, Vehicular, Cloud, IoT, and Computing". The World IT Congress will be the most comprehensive international events focused on the various aspects of Advances in IT, Applications, and Services (AITA). The congress will provide an opportunity for academic and industry professionals to discuss the latest issues and progress in the area of AITA. In addition, the congress will publish high quality papers which are closely related to the various theories and practices in AITA. Furthermore, we expect that the congress and its publications will be a trigger for further related research and technology improvements in this important subject.